Often asked, ‘What is the tree with all of the red flowers in December’. Well it’s most likely the Illawarra flame tree, or Brachychiton acerifolius a stunning feature tree for larger gardens. This is a large rainforest tree growing to 35m in its native habitat ( often less in cultivation) that produces a great display of red flowers during early summer. The Illawarra Flame Tree is one of the most spectacular Australian Native trees when in full flower. This is a deciduous tree, it loses its leaves in late winter to spring, just before flowering. The flowers take over and then the foliage reappears after the flowers. Although the Illawarra Flame Tree is found growing as far south as Melbourne it can struggle, in years where the winters are warmer it will grow well, however a cold wet winter will set it back. Having said that a number of good specimens can be found in the Royal Botanic Gardens, better suited to a warm protected position, or warmer climates. 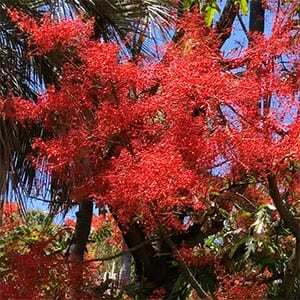 Full sun and a well drained position Brachychiton are generally undemanding. Widely used in street plantings many species make great shade trees. Soil – Tolerant of a range of soil conditions except for waterlogged soils. Growth Rate – Slow, slightly faster in good soil and warmer climates. Comments – Frost Tolerant – Attractive Glossy Green Foliage.